Home > Archives > Locomotives AEM-7 No. 901 and E-60 No. 966, 1980s. Locomotives AEM-7 No. 901 and E-60 No. 966, 1980s. Color photograph depicting AEM-7 No. 901 and E-60 No. 966 at the Ivy City Yard in Washington, D.C.; dates to the early 1980s. Both electric locomotives types were used on the Northeast Corridor and were replacements for the GG-1s inherited from the Pennsylvania Railroad. 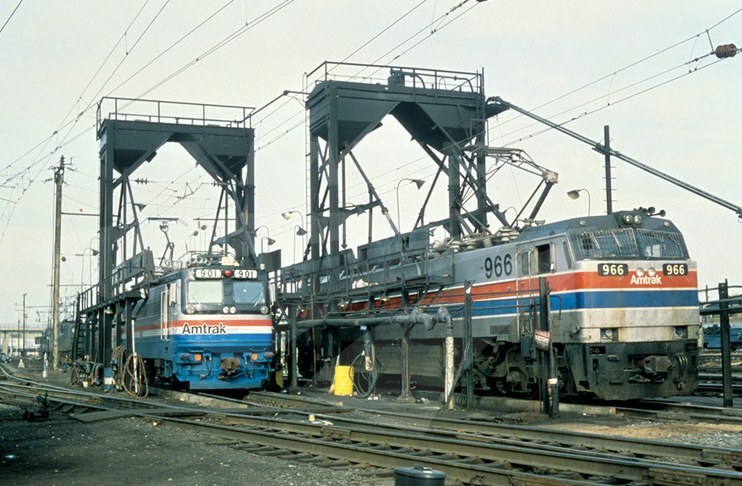 The E-60 locomotives were built by General Electric between 1974 and 1976 and were the first new electric locomotives ordered by the company. Amtrak contracted with the General Motors Corporation's Electro-Motive Division (EMD) to design and manufacture the AEM-7, a high-speed, lightweight model based on Swedish designs. The AEM-7 was produced from 1978 to 1988, and could reach speeds up to 125 mph. Amtrak photo.